One of the recent purchasers of my Lures, Layer Cake Creative here in Denver, requested an interview to learn more about my art making process and my thoughts around being an artist. You can read the interview on their site and discover more about their full service marketing firm, or read below. It's great knowing this piece exists in an appreciative atmosphere. Thank you Layer Cake! How did you decide specifically upon the LURE concept? 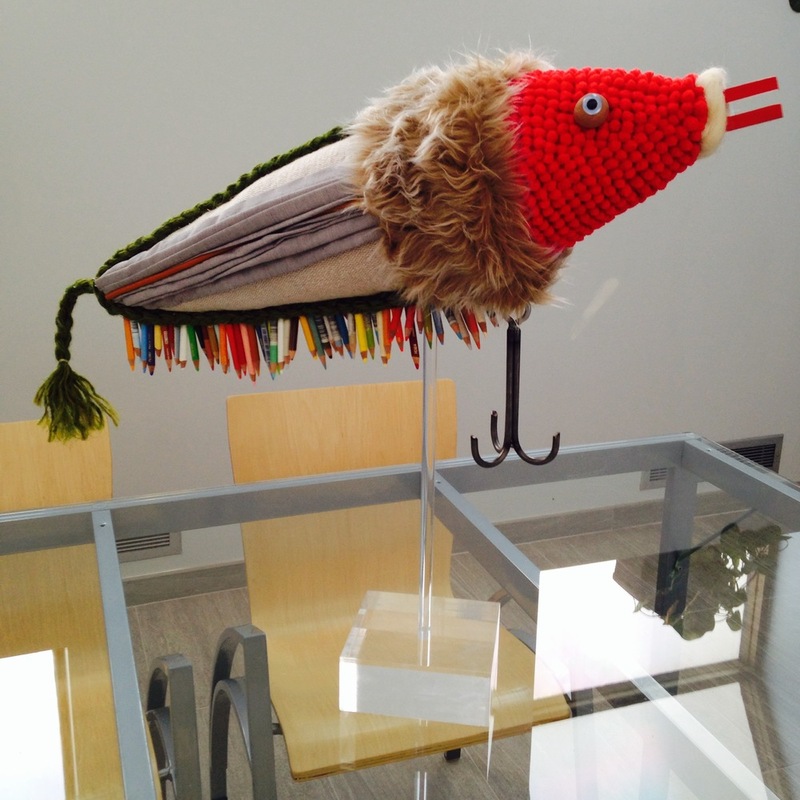 Why a collection of giant, playful, colorful – but confrontational, fish bait? “With most of my projects there is a long period of contemplation followed by an epiphany. In this case, the venue for the work was different, it being the first time I was invited to participate in a design, as opposed to a fine art, event. My work has been hovering between the two disciplines for a while now, and over the last couple of years I’ve actually been more excited by the possibilities inherent in creating functional design work as opposed to singular fine art pieces. That being said, my design works are absolutely derived from my art, either drawings or sculptures, and without the art practice there would be no product. I really love the interplay. I initially put a lot of pressure on myself to make some pieces that could become a product line (furniture, home goods, kitchenware), but after months of contemplation and sketching ideas, I realized that I was running out of time and that it would be easier for me to stick to my strengths in fabric sculpture. This lead to considering a line of pillows, a set of small quilts, some woven banners – but all of these skirted the theme of CAST. Eventually, one evening during dinner, I thought of making Lures, and it made me laugh, picturing the finished works. I immediately knew that they were a do-able project for the short time frame and allowed me to work in the familiar while also leaving room for experimentation – elements that would bring me great joy in the making. What was the most challenging aspect of creating these pieces, in terms of construction? “The level of detail; they were rather laborious. All five of the pieces required a ton of patience but rarely were they tedious. There was a lot of machine and hand sewing, exploration of colors and textures and how they were relating in each work, manipulation of material through cutting, braiding, folding, wrapping, shredding; but nothing was all that tricky. Mostly things just required persistence. The eyeballs were challenging to mount, glitter is hard to confine, really it all just took a lot of time. In The Marker, the piece you obtained, getting the row of pencils how I wanted it was a bit trying. I drilled holes in the pencils and ran a wire through them into the armature. I tacked the wire every three inches or so, but it kept bowing. Eventually I added a braided green jute on both sides which acted as a sandwich and held the pencils in place. I love the way it looks with that bordering element. These moments are really enjoyable – when necessity is the mother of invention and the piece transforms itself in ways that I hadn’t expected. You are a writer, designer, and an artist who works in multiple media. How do you decide which medium (or combo of them) will best convey a new idea? “I absolutely love all realms of creativity and unquestionably the best scenarios are those where they all come together. I used to put on puppet shows, and what I liked most about that was working with costume, sculpture, drawing, writing and music. One of my dream gigs is to design costumes and sets for a far-out avant-garde opera. When opportunities arise with others, if I’m interested, I explore whatever medium is called upon, and I do love collaborating. Mathias and I are continually working on a series of furniture that we hope to launch in the near future. Typically however, my drawing practice is primary and most everything unfolds from there. Currently, I’m focused on creating surface designs based on my drawings. Sometimes I explore sculpture without an initial drawing but just an idea – that’s what happened with the lures. I’m also very influenced by what I’m into at the time. If I get the idea for a story, then I’ll write and follow that by drawings or dolls. I’ve always wanted to publish storybooks.